With so much of last week’s Android news focusing on Verizon’s new Droid Incredible, some of us forgot about the upcoming T-Mobile myTouch 3G Slide edition being spotted in the wild. Now today, we have some hard specs and some user opinion. T-Mobile recently decided to reward some of it hard working employees with a trip out to Las Vegas along with a free myTouch 3G Slide to test out and help give some feedback on the new device. This was a team effort between T-Mobile and HTC. They were eager to get some real user opinons on the new handset. The myTouch 3G series is a popular choice of T-Mobile customers and their flagship phone. The new Slide model is coming off the heels of a very successful release of the myTouch Fender and myTouch v1.2. The name says it all for this new Android powered phone. 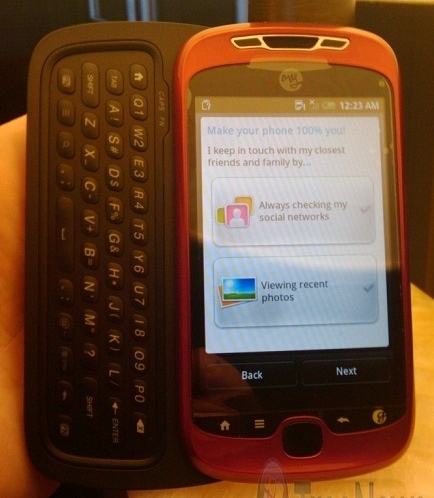 This version of the myTouch has a slide out keyboard, hence the name myTouch 3G Slide. Aside from the sliding QWERTY keyboard, the new myTouch looks similar to its counterpart. The new myTouch did get some impressive upgrades all around. It’s possible that the new screen is a bit bigger. The source compared it to the iPhone 3Gs’ screen, that was the best way to put it, he thought. The one big question is it’s still unclear if it has a AMOLED display or just a capacitive display. Time will tell. It’s powered by a 600MHz ARM processor with a nice upgrade of RAM, 512MB to be exact, along with 512MB of internal storage These amounts are considerably more that the original myTouch 3G. It will also have a nice 5 megapixel camera with LED flash and of course auto-focus. There is also a chance that it might support the new HSPA+ speeds, but again it’s still unclear, and lastly a 1300 mAH battery. It will be bundled with a 8GB microSD card. The biggest addition is the jump to Android 2.1 (yes!). If that wasn’t enough it will also be running HTC’s newest Espresso Sense UI on top of Android 2.1. That will givc it a huge change and completely new life. Although the slower 600MHz cpu will not be able to run the new Live Wallpapers, that have become a popular choice for Nexus One users. I think people will be able to live without that feature, there are a lot of goodies in the Espresso SenseUI to play with instead. The new myTouch 3G Slide is also following a very successful myTouch 3G Fender edition campaign, which saw the final round of phones shipped out in the beginning of this month. It’s not too surprising after the first batch of Fender phones sold out quickly. Getting back to the Slide, it was approved by the FCC just over a week ago. The Slide was also spotted in RadioShack’s internal computer system, meaning it would be heading there possibly soon. But I believe the launch date up in the air, for the myTouch 3G Slide, is on May 19th. So I am sure we will learn more as that day approaches. All this great news is courtesy of Android and Me and one of their readers, who was one of the lucky few to get a test model. Its sad to see T Mobile still fiddling around with second or third tier phones. Keep the touch.. give me an Incredible or a Desire. The rest just doesn’t cut it. A G1 is just as effective as a “brand new mytouch”.